Hi, I'm Allison, and I'd like to share How I Feel About Books! I've been sharing book reviews and bookish musings on this site for over four years now! In that time, I've read countless amazing books (well, I kept count via Goodreads) and even written one! (Not counting all those drafts waiting patiently in notebooks and on my hard drive...) Library Volunteers: A Practical Guide for Librarians publishes May 15, 2019 from Rowman & Littlefield, and I couldn't be more excited! Read more about the book here. I have a four-year-old son who already loves books as much as I do! We read two every night, and he always asks for one more! When I'm not reading, you can find me taking pictures or playing around elsewhere on the internet. I created this blog for my Fall 2014 class LS5603 Literature for Children and Young Adults, as a graduate student in the School of Library and Information Studies at Texas Woman's University. My concentration was library services for children and young adults. Since I graduated in 2016, I've worked as a teen services librarian in a branch of the public library, as an elementary school librarian in a public school, and as a librarian in a Montessori elementary school. I've previously volunteered and worked in the SRVS Learning Center for adults with disabilities. While I was there, I started a program called We Are Storytellers, where individuals drew pictures and told me a story to create their own books. I have also led a monthly storytime for adults with disabilities, and facilitated a weekly book club for people with disabilities. I strive to use my passion for disabilities, along with my MLS degree and dedication to reading, to specialize library services for children and teens with disabilities. 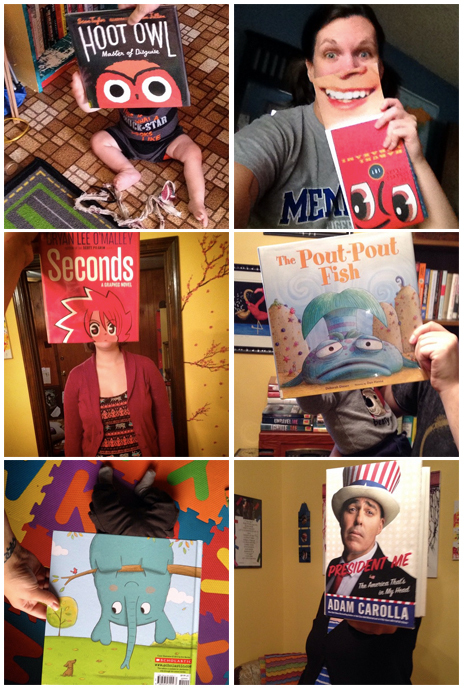 Some of our favorite #bookfacefriday pics!